Here's another big Zenith radio from 1940. Again sporting an original finish with all original knobs, grille cloth and buttons in place. Blake went through this radio--capacitors, bad resistors, bad tubes all replaced. It has a new green tuning eye and power cord. It has a rotating self-contained antenna, and picks up stations strong across the dial. This is a strong radio that was in my living room for a while, and I listened to it every morning. 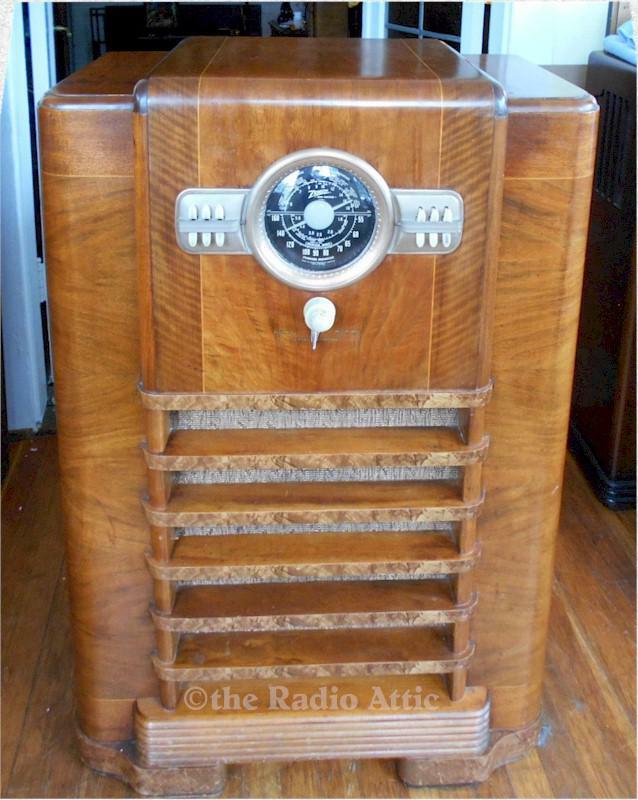 The patina gives this radio some character showing it has lived its almost 80 years with style and grace. I bought this in working condition from an elderly couple that had it most of their 60 year marriage, but alas couldn't fit it in as they moved to a smaller place. What a great history and life it has had and it's ready for many more years of enjoyment. Great price for a working ten-tube console radio! We ship our consoles by Greyhound. Please allow $150-$200 for shipping and handling. 42"H x 29"W x 16"D.
You are visitor number 3,017 to this page.